To report a pothole on a state road, please visit the link and click "Report-a-Pothole". 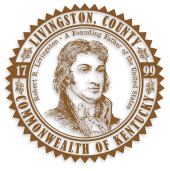 The Road Department's Mission is to provide the residents of Livingston County with a safe transportation infrastructure, while maintaining an efficient, effective and safe County Road Department, by providing the necessary equipment for a productive and safe working environment for the Livingston County Road Department Employees. What is a County Road? County Roads are public roads that have been accepted by the fiscal court and maintained by the county as a part of the county road system. Included in this system are the necessary bridges, culverts, sluices, drains, ditches, waterways, embankments, and retaining walls (KRS 178.010). No county road may be established, be discontinued, or have its location changed unless due notice has been given under the provisions of KRS Chapter 178. Notices must be published pursuant to KRS Chapter 424 by the county road engineer (KRS 178.050). The public notice required by statute is jurisdictional and, until the notice is given, the fiscal court is without the power to proceed. The provisions of KRS Chapter 178 relate solely to county roads and have no application to highways under the control of the Transportation Cabinet.